Keeping a praying mantis as a pet is fun and is not hard at all. But of course a praying mantis does need proper care to stay healthy and strong. It doesn’t really matter if you have bought your own pet mantis, or if you found a mantis in nature, most of them need the same basic care. The following points will help you in keeping your praying mantis happy and healthy! To house your pet praying mantis, you need an enclosure filled with appropriate substrate and some surfaces or branches for climbing and hanging. Make sure the enclosure of your pet is suitable. This means that the cage, box or terrarium is at least 3x longer than the body length praying mantis and 2x wider than the body length of the praying mantis. This will ensure that the mantis has plenty of space to walk around in and to use when it will shed its skin (molt). The cage should also have proper ventilation. Place substrate on the bottom of the tank, terrarium or cage. This substrate can be anything that will absorb water and that will not mold easily. For example: tissue paper, vermiculite, potting earth, shredded wood, pieces of bark or sand. The purpose of the substrate is to release water slowly, thus keeping the humidity in the tank a bit more constant. Fill the enclosure with branches or other objects where the mantis can sit on or hang from. You could use branches, twigs, reeds, stiff dry grass, fake plastic flowers or plastic decorative branches. Make sure the objects are safe for the mantis, e.g. without glue or insecticides, and that there is plenty of space left for the mantis to move around. To read more about possible enclosures, their differences and some important safety tips you can read the page Enclosure. 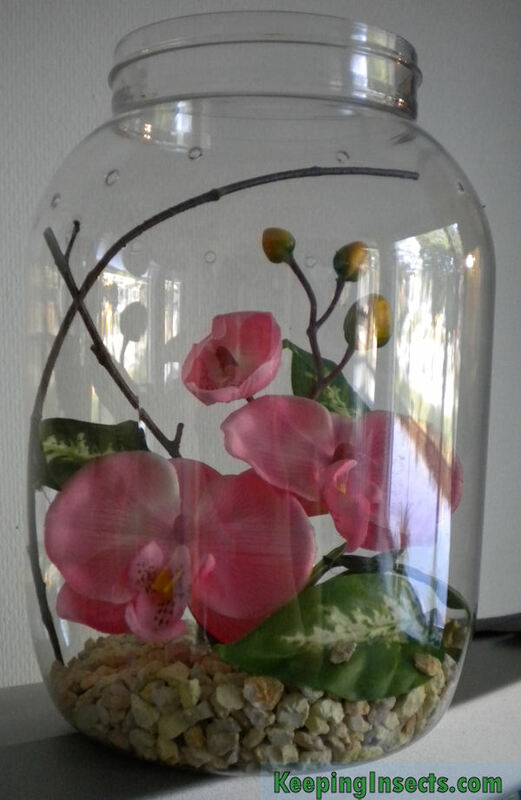 A possible enclosure for an Orchid Mantis or other flower mantis. On top should be a ventilated lid. Every mantis species needs a specific temperature and air humidity to survive. Some species live in damp forest areas, while others live in desserts or dry grasslands. Which specific requirements your species of choice has, can be read in the species description on the right. How to maintain a proper humidity and temperature, read the respective pages: Humidity and Temperature. To ensure proper humidity, you need to spray the enclosure of your mantis every day or every week, depending on the type of housing and on the species of mantis. If you have more ventilation holes you will need to spray water more often to keep the humidity high. Of course you have to feed your mantis. But unlike other pets such as cats and dogs, praying mantids do not need to eat every day. Feeding them every day can be bad for some mantis species! You have to feed your mantis every one to four days, depending on the species, the type of food you give it, the size of the mantis, the body condition of the mantis (well-fed or skinny) and its life-stage (adult females need more food than adult males). 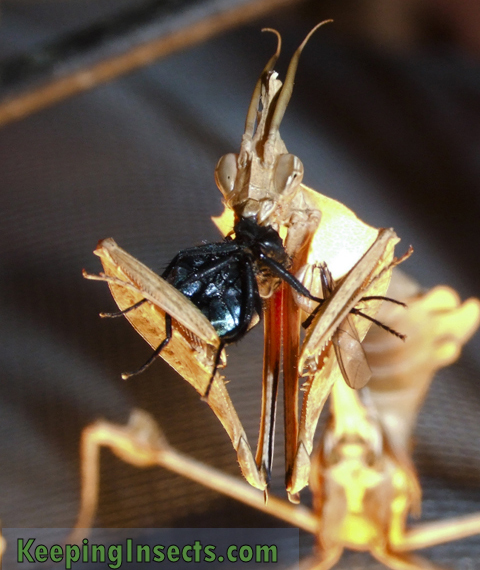 Mantises only eat live insects for food. This can be flies, crickets, moths, caterpillars, locusts and some other insects. If you want to read what types of food your mantis will eat, read our page Live Food. If you want to breed your own fruit flies, you can check out our handy DIY fruit fly breeding page. When feeding your mantis, make sure the mantis will actually eat the food you offer it. When you introduce live food to the enclosure of the mantis, this food can hide or escape. When this happens often the mantis will starve. To make sure your mantis will eat what you offer it, you can watch until he has caught the food. You can also offer the food with tweezers directly to the mantis. If you do this carefully the mantis will grab the live food item directly from the tweezers and will start eating instantly. Prey that moves a lot, like flies, will generally be caught much more easily then prey that hides, like cockroaches or caterpillars. A ghost mantis with an empty stomach and the same one just after eating a large meal. The enclosure of your mantis hardly needs any cleaning. 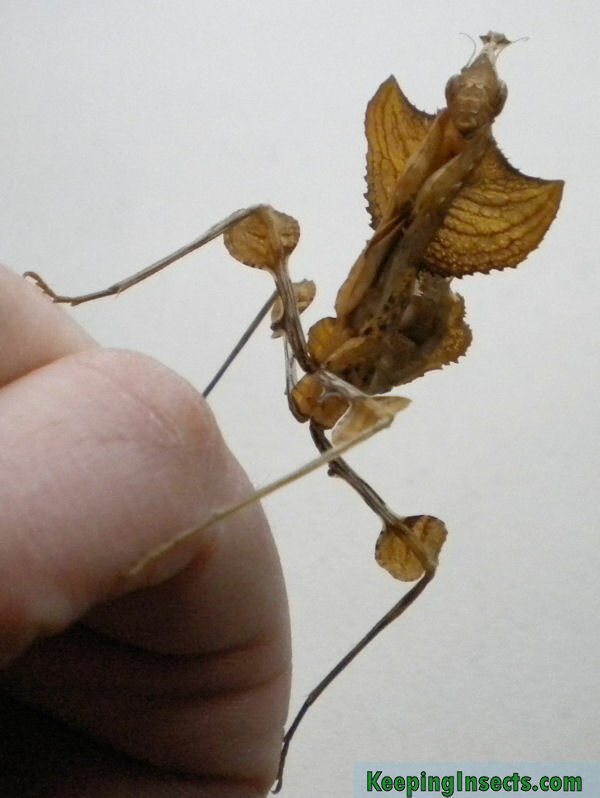 Mantids are small and do not produce much waste. Make sure to remove any half-eaten prey items to prevent them from becoming smelly. When cleaning the enclosure of your mantis, just remove all substrate and wash the inside of the enclosure with hot water. Do not use any detergent as this can harm the mantis. Dry the enclosure and add fresh substrate. So, you have a Carolina mantis or Chinese mantis and you want to know how to house it and how to take care of it? Cool! Read the caresheet at our Species page. Every species has its own page listing their specific requirements and telling you more about the species.